I finally got a chance to listen to this one! I had a smile tattooed on my face while I listened to Spider spin his SF web. I knew I would be interested to hear this one especially because it is set in and around Vancouver, British Columbia, where I live and it is chock full of local details. But after hearing it, and realizing that most people who don’t live in BC probably couldn’t care less about the setting what I really wanted to talk about is something a lot of listeners/readers might have missed that they should care about. 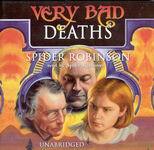 Spider Robinson wrote this novel as homage to Crime Writers Of America Grandmaster Lawrence Block. Most SF readers probably don’t know who Block is but they should. Block is a prolific and talented author working in the crime genre. In VBD Robinson uses many turns of phrase that are ones Block uses almost unconsciously in his many stories. Other giveaways include the theme of a horrifically understandable serial killer and a deep and abiding love of coffee. Robinson has done this sort of thing before – his novel Callahan’s Con was an homage to Block’s contemporary – fellow Crime Writers Of America Grandmaster Donald Westlake and Callahan’s Key was inspired by the writings of Robert A. Heinlein. Another neat feature of Very Bad Deaths is that it contains the only reference in fiction to the philosophical writings of Daniel Dennett that I know of – he also manages to tie Dennett’s concepts into the book’s plot. Spider is currently “collaborating” with Heinlein on a novel titled Variable Star, I hope Blackstone Audio acquires the audio rights to that one and that they get Spider to narrate! 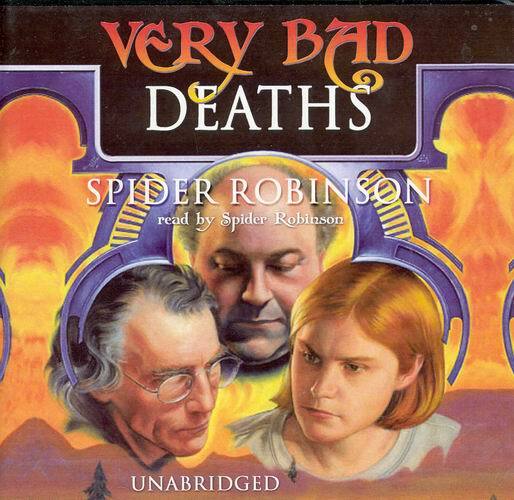 Oh and a sequel to Very Bad Deaths is also in the works.